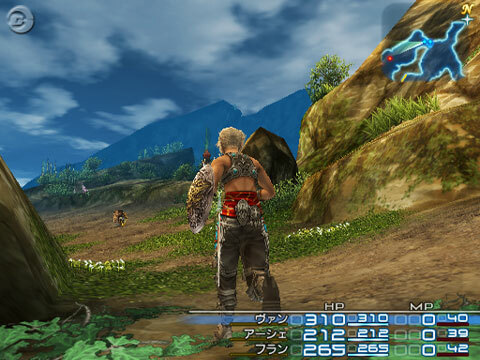 The battle system in Final Fantasy XII is not the same anymore as in other Final Fantasy games. So no more turn based battles anymore. The battles are real-time now and you'll see the enemies on the field. So gone with random encounters, which was getting annoying and many fans wanted something different. What remains the same is that after battle you receive exp, money and maybe an item. A new feature in the Final Fantasy XII battle system is the gambit system. With it you can automate your party by using "Gambits", which are customized attacks. It determines under which condition the character will attack or will cast Magick, use an item or a Technick. You can turn Gambits on and off at any time for your character if you want to do it the usual way. When you defeat enemies you'll gain License Points. With those you can acquire Licenses that enable Magick and Technicks and determine which arms and armor they can equip. This way you can decide on your own which abilities your character wants to learn and not have abilities that are set to a job.